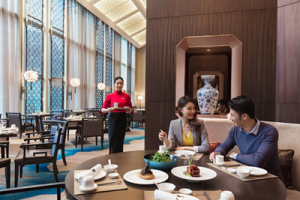 Marriott International, Inc. (NASDAQ: MAR) today announced the launch of the new Club Marriott, combining Club Marriott, Eat Drink & More, and Star Privilege – three powerful dining loyalty programs in Asia Pacific – into one single paid membership program. The newly combined Club Marriott will provide members with more choices and benefits whenever they dine out in their hometowns or visit one of the 200 participating hotels (with more hotels joining every month) across 15 brands in 13 countries across the region. The new Club Marriott membership offers experiences that go beyond food & beverage, and hopes to build an even stronger loyalty base that recognizes guests with exclusive events, experiences, and a sense of community. The new Club Marriott opens the door to endless hotel experiences. Members may enjoy 20% off F&B and best available room rates at all participating hotels in Asia Pacific. Even when members are not traveling, they may continue to benefit from room privileges such as complimentary stays, upgrades, and Spa, Fitness and Wellness vouchers. Members will also be personally recognized on special occasions, from catering discounts for those important dates and invitations to exclusive member events. Club members’ children will also be treated to parties and surprises. The Pacific region is the first to launch this special membership program in six key locations in Australia, New Zealand, Fiji, New Caledonia and Samoa, currently involving 25 hotels. Members will be able to save with two additional dining certificates for group dining or use their personal dining credits in a number of exceptional restaurants, receive welcome amenities, room discounts, upgrades, and spa vouchers at participating hotels, and enjoy birthday offers as well as access to exclusive member events. Membership is also recognized beyond the Pacific with F&B and room discounts in participating hotels in Asia. Following the launch in the Pacific, the new combined Club Marriott program will be rolled out in the rest of the Asia Pacific region starting in Mainland China, Hong Kong, Macau, Singapore, Malaysia, Vietnam, Guam, Indonesia, India, Japan, and Korea throughout July, August and September. The Philippines will be launching the program in November, and Thailand by December this year.